In one of my earlier articles I discussed how to upload files using full page post-back as well as Ajax post-back. Usually developers use the file input field to select one or more files to be uploaded from the client machine. 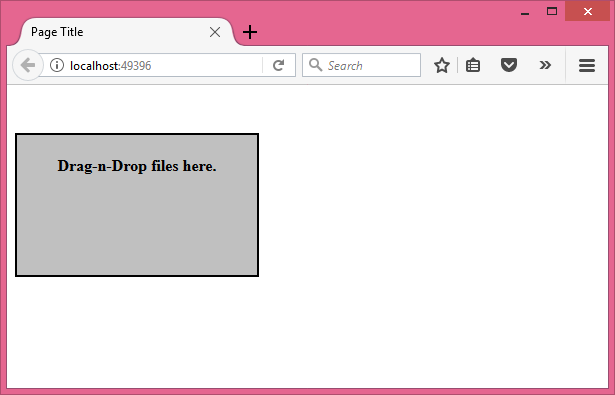 However, you can also HTML5 drag-n-drop to make it easy for the end user to pick files directly from Windows explorer. To that end this article shows how to implement just that. Before you begin developing this example, let's see the expected behavior of the application. 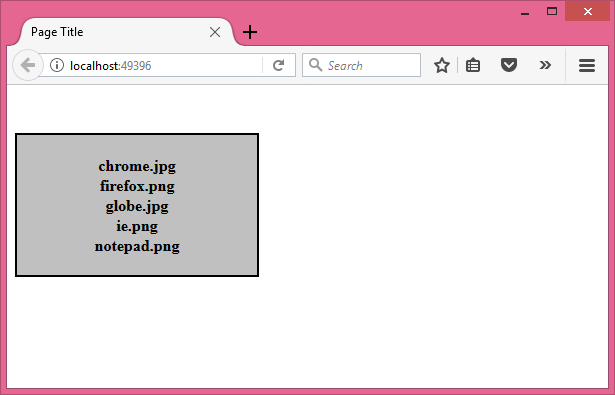 Have a look at the following figure that shows a region of the page (let's call it file basket) ready accept the files. You can open Windows explorer, select one or more files that you want to upload, and then drag-n-drop them onto this file basket. Once you drag-n-drop the files, they will be listed in the file basket and immediately the file upload operation will begin. A progress indicator displays that the file upload operation is in progress. Once the files are successfully uploaded to the server, the file basket shows the number of files uploaded along with the total byte count. Ok. Now that you understood how the application works, let's write some code. Notice that the form contains the file basket <div> element and the progress indicator <img> element. Next, add a script reference to the jQuery library in the <head> section. Also add another empty <script> block below the script reference. The code basically wires the previously mentioned on the fileBasket element. In all the event handlers we call preventDefault() and stopPropagation() to prevent the default action and to stop the bubbling-up of the event. Also notice that the ready() function hides the progress indicator image so that initially the progress indicator is not displayed. Now let's discuss the drop event handler where the main code is to be placed. The code shown above grabs the files drag-n-dropped by the user using the evt.originalEvent.dataTransfer.files property. It then iterates through the files array and gets the file names using the name property. The list of names is then filled into the fileBasket element. Then the code creates a new FormData object. The FormData is a programmatic representation of the form values to be submitted to the server. Another for loop iterates through the files array again and adds all the selected files to the FormData object. This is done using the append() method of FormData. Then an Ajax POST request is made to the UploadFiles() action of the HomeController. Notice that the contentType and procesData properties are set to false since we are sending files through the FormData. The data property is set to the FormData object. The success handler shows a success message (more on that soon). The error handler displays an error message. The beforeSend and complete handlers show and hide the progress indicator image respectively. The UploadFiles() method grabs the files accompanying the request using the Request.Form.Files collection. A foreach loop iterates through the files collection. 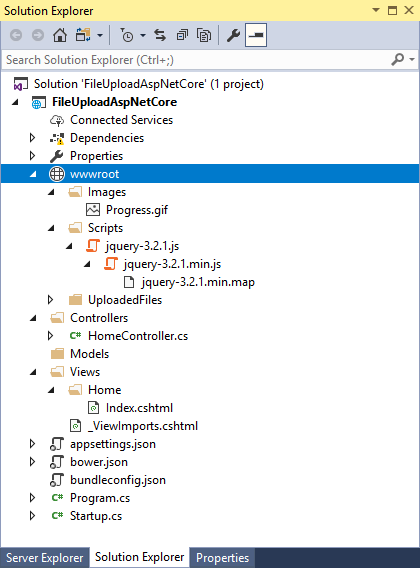 Each entry from the files collection is an IFormFile object. We need to compute the server side path where the file is to be stored. 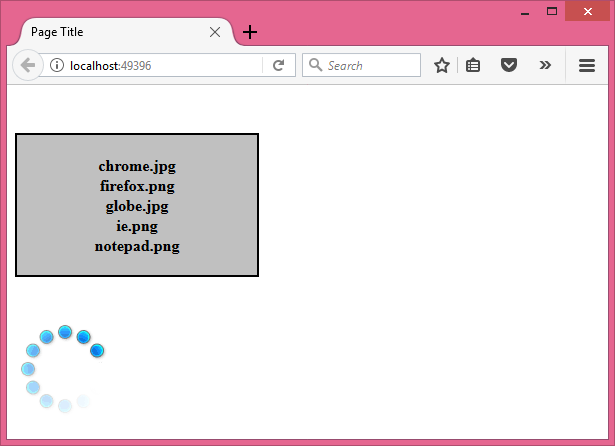 This is done using the WebRootPath property of IHostingEnvironment object. You need to inject the IHostingEnvironment object into the controller (discussed later) to access it in the UploadFiles() method. 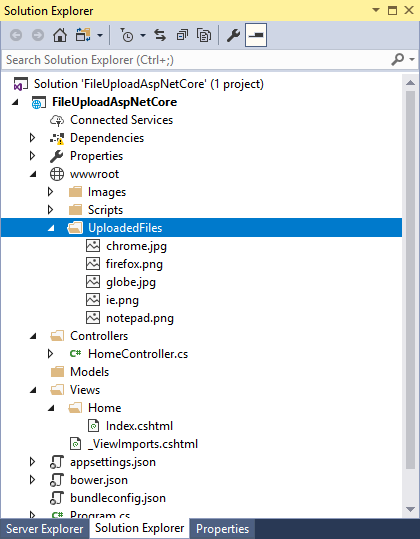 The FileName property gives the client side file name and we append it to the UploadedFiles folder. The Length property gives the size of the file and we add it to the size variable. Then the code creates a new FileStream and copies the files's content into it. This way the uploaded file gets saved to a file pointed by the FileStream object. Once all the files are uploaded, a success message is formed that informs the user about the number of files uploaded and their total size. The success message is returned to the client using the Json() method. The code declares IHostingEnvironment variable - hostingEnv - in the HomeController. The constructor receives an IHostingEnvironment object through the DI framework and stores it in the hostingEnv variable. This completes the code. You can now run the application and test the working by dragging and dropping a few files from the Windows explorer. If all goes well you will see those files inside the UploadedFiles folder.